Join Triple S Harley-Davidson for an incredible 14-day you in South Africa and Swaziland. The tour features stunning roads and landscapes, premium accommodations, meals and activities. Highlights include Cape Town, South Africa’s Wine Route, Garden Route, and two nights at a luxury game lodge inside Kruger National Park, where “on safari” you’ll experience Africa’s “Big Five”. The Southern Cross is the first part of our three-trip African Trilogy. The trip through South Africa and Swaziland offers an unforgettable Adventure for motorcyclists who wish to incorporate Africa into their globe-riding plans. This 14-day Adventure could have been named “Best of South Africa”; we’ve incorporated more of South Africa’s highlights into our Southern Cross Adventure than you’ll find in any other South African tour. Why fly all the way to Africa and miss any of the following highlights? Upscale accommodations, starting with Cape Town’s Victoria & Alfred Hotel on the Pierhead at the Waterfront. Overnight accommodations in an upscale but rustic lodge at the southernmost point of the African continent – where the Atlantic and Indian Oceans meet. Each of the lodge’s eight rooms features a private balcony overlooking the ocean. An overnight stay at a working wine and ostrich farm in the setting of a 4 star Cape Dutch Country House. A two-night stay at a premium hotel on the waterfront in Knysna – a small South African town that for several years has been recognized as South Africa’s favorite vacation spot. An overnight stay in Swaziland, with a ride through the beautiful Swazi Mountains. The “Grand Finale” – two nights in a luxury game lodge in the midst of the Kruger National Park. Multiple game drives, including evening game drives, are an important part of this exceptional experience. Some competitors offer a game drive through the park, but only Ayres Adventures offers two nights inside the park in a luxury tented game lodge. 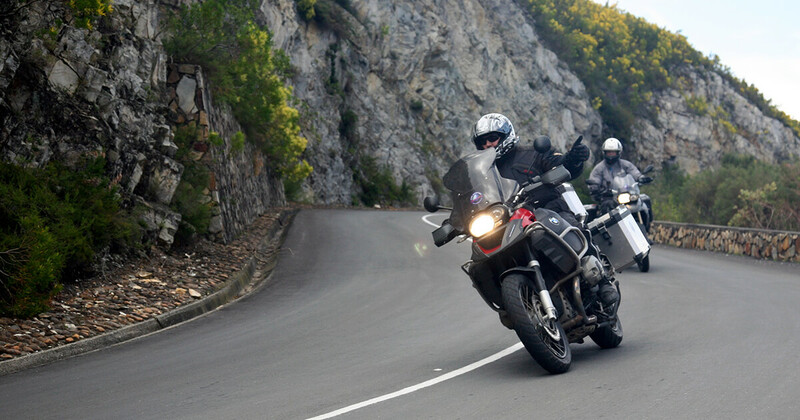 Our Southern Cross Adventure includes plenty of the country’s most popular motorcycling roads, coupled with an opportunity to truly enjoy the wildlife and cultural aspects of this fascinating area of the world. Although our route is totally paved and ideal for two-up riding, this tour offers exciting off-pavement alternate routes as well. Off-pavement opportunities include South Africa’s Swartberg Pass, Prince Alfred Pass, Montague Pass, Swaziland’s Saddleback Pass, and many others. Day 1 - Arrival Cape Town, 0 km. Day 2 - Cape Town to Cape L'Agulhas, 280 km. Cape Town to Cape L’Agulhas, 280 km. Day 3 - Cape L'Agulhas to Oudtshoorn, 325 km. Cape L’Agulhas to Oudtshoorn, 325 km. Day 4 - Oudtshoorn to Knysna, 150 km. Oudtshoorn to Knysna, 150 km. Day 5 - Free Day in Knysna. Day 6 - Knysna to Fort D'Acre, 439 km. Knysna to Fort D’Acre, 439km/ 275miles. Day 7 - Fort D'Acre to Port St. Johns, 427 km. Fort D’Acre to Port St. Johns (~ 427km/267 miles). See traditional South African life as it exists in rural areas of the country. Pass through the former Transkei and Siskei areas, which, during the apartheid years, comprised the black “Homelands”. Landscapes are very pretty, with deep valleys and many scenic overlooks. Our destination is Port St. Johns where we will be staying at a wonderful resort and Spa for the evening. Day 8 - Port St. Johns to Himeville, 281 km. Port St. Johns to Himeville (~ 281km, 176 miles). Day 9 - Himeville to Dundee, 333 km. Himeville to Dundee (~333km/208 miles). Day 10 - Dundee to Piggs Peak, Swaziland, 348 km. Dundee to Piggs Peak, Swaziland ( ~ 348 km, 217 miles). Day 11 - Piggs Peak to Kruger National Park, South Africa, 100 km. Piggs Peak to Kruger National Park ( ~ 100 km, 62 miles). Spend two nights in one of the most popular game parks on the African continent. Spending the nights ‘IN” the park (as opposed to visiting it for a few hours during the daylight hours) provides the unique opportunity to do game drives after dark as well as during the day. Most of our guest are able to spot all five of Africa’s “Big Five” during their stay (Elephant, Lion, Leopard, Rhino, and Cape Buffalo). Enjoy luxury game lodge accommodations and dining under the African skies. Day 12 - Free Day in Kruger National Park. Free Day in Kruger National Park. The free day in Kruger National Park is certainly one of the most important highlights of the Southern Cross Adventure. You’ll enjoy both morning and evening game drives, including a “sundowner” game drive. Enjoy you favorite drink as you enjoy the sun setting over the African bush. Day 13 - Kruger National Park to Sandton, 480 km. Kruger National Park to Sandton ( ~ 480 km, 298 miles). Enjoy an easy ride to Johannesburg and, on to Sandton. We’ll have a final celebration dinner at one of the many fine restaurants in the Sandton area. Day 14 - Departure from Johannesburg.